Hoosier Farm Babe : New Mom Book Giveaway Winner Announced!! New Mom Book Giveaway Winner Announced!! Congrats Sarah! I will be in touch shortly to get you a copy of Baby 411! And in the meantime, I have come across one more book to add to my list of book recommendations! I had the pleasure of meeting the author of this book at Blissdom 2012 - my first official blogging conference in Nashville, Tenn. last month. Me Ra Koh gave a two-part photography session titled Shoot Like a Woman. I fell in love with her (ok ... not literally), but she is pretty awesome. I had so many take homes from her sessions that I really feel like I'm on the path to greatly improving my photog skillz. But her session wasn't just about getting to know and being comfortable with the mechanics of your camera - it was about using your camera as a tool to capture life's little memories instead of the typical grip and grin (though I do love those on occasion too). 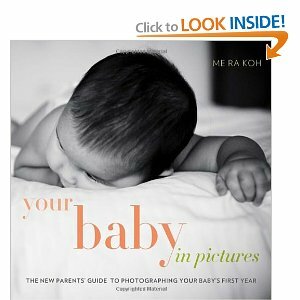 Whether you have a point-and-shoot or a DSLR, this book has some great tips for capturing the beauty of your baby's first year of life. And while my baby is almost two now, I still found so many helpful hints, photo recipes (including aperture and shutter speed settings), info on lighting and much more! If nothing else, I'd encouraged you to check out Me Ra Koh's website.